1. Catherine Sarah EDWARDS, daughter of Paul John EDWARDS (1965- ) and Susan MITCHELL (1962- ), was born on 2 October 2002. 2. Paul John EDWARDS, son of Cyril Llwellyn EDWARDS and Josephine Mary TORRANCE, was born on 1 March 1965 in Wembley, London. He married Susan MITCHELL on 7 March 1992 in Oldway Mansion, Paignton, Devon. Rebecca MITCHELL (1983- ). Rebecca was born on 1 February 1983 in Swindon. James Michael MITCHELL (1986- ). James was born on 1 September 1986 in Swindon, Wilts. Joseph Matthew EDWARDS (1992- ). Joseph was born on 22 July 1992 in Swindon. 4. 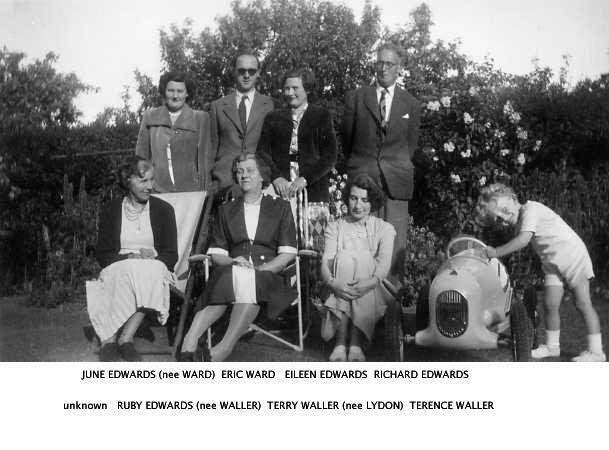 Cyril Llwellyn EDWARDS, son of Richard John EDWARDS and Ruby Charlotte WALLER, was born on 14 May 1916 in 78 Hanover Road, Brondesbury Park, Willesden. He married Josephine Mary TORRANCE on 14 September 1963 in Torre Church, Torquay, Devon. He died on 20 September 2004 in Torbay Hospital, Torquay, Devon. He married Terry LYDON. Nicola Jane EDWARDS (1969- ). Nicola was born on 4 April 1969 in Upton Hospital, Slough, Bucks. She was baptised on 27 July 1969 in Torre Church. She married Adrian David Graham HUGHES on 1 June 1991 in Oldway Mansion, Paignton, Devon. Mark David EDWARDS (1969- ). Mark was born on 4 April 1969 in Upton Hospital. He was baptised on 27 July 1969 in Torre Church. He married Bridie Morven GLOVER in September 1985 in South Devon Technical College.